Log cabin style bed & breakfast with all knotty-pine interior/exterior with custom log furniture throughout. 14 rooms vary in accommodating 2-4 guests each. 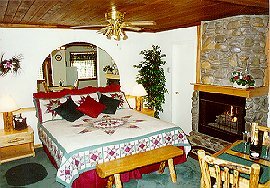 Rates vary upon Season ranging from $125 to $185 per night. Discounts available off-season. Also ask about our 1-4 bdrm cabins located on and off the property. "Honeymoon" & fireplace suites available. All rooms offer a microwave, refrigerator & coffee maker, private bath with shower, cable TV, HBO & Encore. All rooms have VCRs with numerous free videos available in Gathering Room. Complimentary to guests is a 1-hour per night private hot tub, sauna & steam bath room (reservations required). A large park with picnic areas include tables, chairs & log swings. BBQ's & patio areas also available outside of the gathering room. Wedding, group & meeting packages offered. Variety of gourmet espresso coffees, hot chocolate and an expanded continental breakfast (cereals, muffins, pies, bread, bagels, fresh fruit, juices, milk) offered COMPLIMENTARY in the gathering room daily. This and other Lake Tahoe Bed and Breakfast Inns can be found here in The Register.